Athens: European leaders struggled to limit the damage Wednesday as world markets plunged at the prospect of a Greek referendum on the eurozone debt rescue plan agreed only with great difficulty last week. The turmoil saw some European markets slump by 5.0% or more on Tuesday and pushed borrowing rates uncomfortably near record levels for Italy, whose economy is already giving cause for concern within the eurozone. Greek prime minister George Papandreou’s decision to hold a confidence vote on Friday and then a referendum on the debt deal wrong footed EU leaders who had laboured hard to put the rescue package together last week. French president Nicolas Sarkozy said the referendum call had “surprised all of Europe." And he added: “France reminds everyone that the accord adopted... unanimously by the 17 member states... is the sole possible way to resolve Greece’s debt problems. “Giving people a voice is always legitimate but the solidarity of all the eurozone countries is not possible unless each one agrees to measures deemed necessary," Sarkozy said. France and Germany, he said, had arranged a meeting Wednesday with Papandreou before the opening of the G-20 summit in Cannes on Thursday. Also expected to take part in discussions with the Greek premier were EU president Herman Van Rompuy, European Commission president Jose Manuel Barroso, eurozone chief Jean-Claude Juncker, and International Monetary Fund managing director Christine Lagarde. There, they would discuss “the conditions under which the engagements undertaken will be kept," Sarkozy added. US president Barack Obama’s spokesman Jay Carney said the uncertainty caused by Greece’s move showed the need for rapid implementation of the eurozone deal. But he added: “It remains the case that the Europeans have the capacity to deal with this crisis and they need to implement the very important decisions they made last week to provide a conclusive resolution to it." Papandreou’s surprise package put Italy back in the firing line, raising fears that it could follow Greece, Ireland and Portugal in needing a bailout and that the contagion could spread even further, to Spain. Italian Prime Minister Silvio Berlusconi, in a phone call with German chancellor Angela Merkel, promised to take rapid action on the economic reforms long sought by his European partners, his office said. “There is no doubt the Greek decision... is having a negative effect on the markets," Berlusconi said. “This is an unexpected decision that generates uncertainties." Italian stocks closed down 6.80% Tuesday with bank shares in free fall, in the worst session since the start of the global financial crisis in 2008. Borrowing rates also shot up to well above 6.0%, approaching levels that most observers believe cannot be sustained for the long term. Papandreou, in a brief call to Merkel, said the referendum would “strengthen the country in the eurozone and globally". But at close of trade Tuesday, Greek stocks had dropped by 6.92%. In a joint statement, Van Rompuy and Barroso said they had full trust in Greece to “honour the commitments undertaken." But other leaders voiced frustration that they had not been informed of his plan at last week’s negotiations. Belgium’s Prime Minister Yves Leterme said Papandreou had said nothing of the plan during last week’s summit. “The Greeks have a right to a prospect of a better future, but they must also be aware that this is no longer a purely internal Greek problem," he said. Spain’s government spokesman Jose Blance said the referendum decision was “not a good decision for Europe and not a good decision for Spain either." Japan’s finance minister Jun Azumi said Wednesday: “Greece’s abrupt announcement on holding a referendum, which was not included in (the earlier agreed deal), has confused people." Eurogroup chief, Luxembourg prime minister Jean-Claude Juncker, said the result of a failed referendum could trigger bankruptcy for Athens. And World Bank president Robert Zoellick described the referendum as a “roll of the dice. “If it passes that could be a positive signal for people. If it fails, it’s going to be a mess," he said. A ‘No,’ vote in the referendum would scupper a deal to cut Greece’s debt of more than €350 billion ($495 billion) by about €100 billion while recapitalising the banks who will take a 50% loss on their holdings of Greek government debt. While Papandreou got unanimous backing from his cabinet early Wednesday, several Socialist deputies had already denounced the plan, with one quitting the parliamentary party to fight it. That leaves the Socialists with just 152 deputies in the 300-seat parliament, making the outcome of Friday’s confidence vote far from certain. 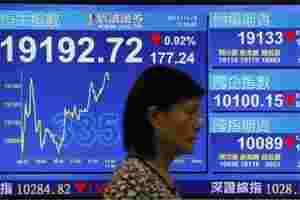 Early trading in Asia Wednesday reflected the sense of uncertainty. Tokyo was down 1.73%, Sydney lost 0.74%, Seoul shed 1.26% while Hong Kong was off 0.92% by lunch and Shanghai lost 1.0%.